During the 18th century Robert Walpole attempted but failed to introduce a system whereby customs duties were paid only on imports when they left the port. 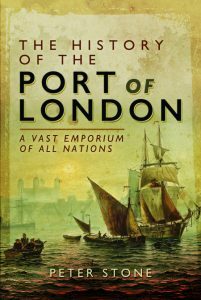 That would then allow London to become a port through which goods could be transshipped to another country without duty being paid. It finally came to fruition with Chancellor William Pitt’s Warehousing Act of 1803. The West India Docks and then the London Docks were the first to be licensed to enjoy such a privilege. Both the West India and London Docks were created by groups of individual merchants and investors. The East India Company, having been established two hundred years earlier, was in a different position. Their ships, of up to seven hundred and fifty tons, were the largest arriving in the port and they anchored in the open river around Blackwall or Gravesend, unloading onto lighters that carried the cargoes to the Legal Quays. They had the advantage of decades of experience governing a whole sub-continent, with a well-paid paramilitary force that was able to provide security for their cargoes. After inspection by customs the good were transferred to the company’s own secure warehouses in the City at Cutler Street that had been opened in 1782. Unlike those who developed the other docks they had not had the severe problems of theft, nor did they require the warehousing that those docks created. Nevertheless, like other merchants, they had long been encumbered by the congestion and delays of the Legal Quays. When the West India Dock and London Dock companies gained the right to create their docks with bonded warehouses the East India Company decided to follow, at their traditional base further downriver at the marshy Blackwall area. The Act that approved the creation of the East India Dock Company gave it a monopoly of twenty-one years for the import and export of goods to the East Indies and China. Being the third set of docks gave them the advantage of the expertise of their predecessors and the company commissioned John Rennie and Ralph Walker to carry out the work. A wet dock already existed at Blackwall – Brunswick Dock – a predecessor of which had been established by the East India Company in 1614 but which they had later sold when it proved to be a financial burden. The initial plan was for two basins: the former Brunswick Dock for exports and a new, larger basin on the marshland for imports. As work progressed it was decided that a third basin would be needed to hold ships waiting to enter the docks and prevent congestion. The entire dock-space could handle two hundred and fifty ships at any time, somewhat less than the London Docks. There was ample quayside but, unlike the West India and London Docks, very little warehousing. Many of the company’s imports were high value goods, such as silk and spices, which were immediately transported to Cutler Street. The biggest challenge for Rennie and Walker in creating the enlarged dock and warehouses was the remoteness of the location, which was at that time only accessible by river, with no road connection to London. It was therefore decided to produce the necessary bricks on the spot and two contracts were placed, each for nine million bricks. The grand ceremony for the opening of the East India Docks was held in August 1806. As the three new dock systems were being constructed on the north bank of the Thames the same was happening on the south side of the river, on the Rotherhithe peninsula between Southwark and Greenwich. Whereas each of those on the north bank were created by a single company what gradually evolved into the Surrey Commercial Docks were developed by competing companies, mostly comprised of timber and grain merchants. Over the following decades the dock companies at Rotherhithe continued to expand and amalgamate until by the early 20th century their operations formed a patchwork of basins that covered eighty-five percent of the peninsula. By the end of the first decade of the 19th century the Port of London had expanded significantly, with three dock systems on the north bank of the Thames downriver of London and several individual docks at Rotherhithe. Not only was the congestion on the river greatly eased but London had become an entrepôt port through which cargoes were able to pass on their journey from one part of the world to another. There was thereafter a lull in the creation of new docks until they were joined by the St.Katharine Docks, which opened in 1828. Sources include: John Pudney ‘London’s Docks’; Fiona Rule ‘London’s Docklands’; Arthur Bryant ‘Liquid History’; John Summerson ‘Georgian London’; Liza Picard ‘Victorian London’; Jerry White ‘London In The 19th Century’. With thanks to Olwen Maynard for proof-reading.